Russell Wilson is a young, vibrant quarterback for the Seattle Seahawks, the team that picked him up as their 12th choice in the 3rd round draft of 2012. Seattle is the home of the 12, aka The Twelfth Man. This is team spirit like you have never experienced anywhere else. We are 12. I am home in Seattle. I like it when it is cold and dark. I am only happy when it rains. We like bands called Garbage, Nirvana, Sound Garden and the descriptive imagery of Alice in Chains and Pearl Jam. We have been backpacking and nature loving while we trail hike in khaki shorts, plain white or eccentrically mismatched socks with Teva style shoes (yes, that means sandals). Some of us are snooty name brand granola and others are passionately resentful young people trying to force their unique perspective out into a sea of tolerance to expression. No one has a voice. No one can be heard. No one but 12. It only takes ONE with a loud voice to make 12. Mathematics falls to its knees and loses all logic when 12 comes to town. ONE makes TWO!! != 12!!!!!!! and then earthquakes happen. Earthquakes that make the news. We are quiet people who keep to ourselves and never make eye contact with anyone who looks weird at all, for fear of having to make a conversation as much as “Hello.” We avoid that word by shifting awkwardly in our seats and praying we never have to take the bus. (Really- we do care about the environment but talking to strangers is absolutely awful.) If we do take the bus we stare blankly ahead or read the poetry of the homeless on the walls. We are miserable and we like it. We had a football team that was pretty cool at first but nothing significant happened for a while. It was cool. It sucked. Some people liked it but most people didn’t care. The team took some serious chances. A lot of people gave up on it but the Seahawks kept getting better, and then worse. Game attendance was dismal. Seattle is home of ingenuity. Born here was Microsoft, Boeing, Amazon, PEMCO, Safeco, Taco Time, PCC, NextStep & Beyond and Nesbit’s Fine Watch Service. There so many more. Football is fun. We should embrace it. People had disdain for football after stadium disasters and stadium battles. In 1976, the Kingdome was born. The Domed Stadium that was Doomed. The first game that the Seahawks played was August 1, 1976 in the preseason. It was a home game at the Kingdome against the San Francisco 49ers. The rivalry was born and so was a noise factory. It was training for the the 12. The stadium was a giant concrete dome that echoed noise and welcomed rock concerts and monster truck shows. It was loud. So intensely loud that we broke it by making enough noise and vibrations that it started to fall apart with people inside of it. It wasn’t that bad though. We fixed it, sort of. It wasn’t long before we figured out that it really had to go. We blew that thing up. The day was celebrated and reveled but also disdained. The Seahawks almost imploded with it narrowly escaping a sinkhole on Post that would have swallowed the legacy of the team so that they could be wrapped up like a curiosity to pick up on the waterfront past the Lusty Lady. Seattle is known for people who do what they want because they can and trends happen. We have made it cool to buy stuff from thrift stores for over 20 years. We took a lot of chances. We kept the Seahawks. We (reluctantly) built them a stadium. We took a chance on Pete Carroll, who has often been highlighted for anything that can be criticized. There were a lot who came before them all, but Pete Carroll gave a chance to Russell Wilson by assigning him as starting quarterback on August 26, 2012. He gave a chance to Richard Sherman, arguably the best corner in the league, when he came charging out of Compton with 1030 All-Purpose Yards behind him as a high school senior in 2005 to Stanford to the Seahawks. He gave chances to Marshawn Lynch (drafted 12th for the Bills, he found his way home), Percy Harvin, Robert Turbin, Matt Flynn and Kevin Pierre-Louis. In 2014, the Seattle Seahawks won the Super Bowl against the Broncos. There was pandemonium. Even Marshawn made a public statement. The 12 do not back down. The Seattle Seahawks have played a tough season with insults, assaults and criticism throughout. One thing that we have that other teams don’t is Russell Wilson. Russell is an eternal optimist and refuses to let anyone get the best of him. He spreads this to the team, the fans, the 12 and he pushes it out, one Hail Mary at a time. The NFC Championship game was yesterday, the Seahawks against the Packers. The game was exciting immediately. The Packers almost had a touchdown on their first drive. Sherman intercepted. 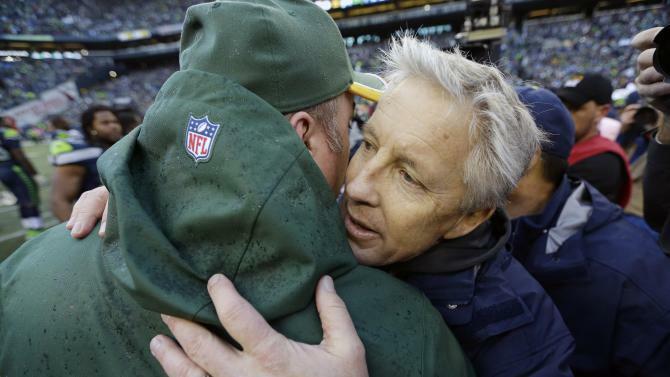 The Packers responded immediately forcing a Seahawk turnover to them. I was not worried. I was not worried when we turned it over again. It looked like Russell was shaken. The Packers started scoring and we kept turning it over. I say we turned it over because I am a 12. We finished the half having achieved the goal of a first down (advanced in the 2nd quarter) but failed to get a score. We almost had a field goal. My adoring husband was downhearted and discouraged. I told him not to give up because Pete Carroll knows that it isn’t how you start but how you finish and we have proven over and over to be a 2nd half team. I later saw the comments on Facebook were bleak. I knew that Russell Wilson would renew his own spirit and reinvigorate the team and we would be victorious. The Seahawks had a secret plan and so did I. No one knew that I had sheetmetal and an axe waiting to call out glory for the Seahawks. My husband and I were watching the game on television with no sound and listening to Steve Raible. We had sent the kids to a neighbor’s house. The radio is 3 seconds ahead of the television. That is awesome because you get incredibly excited listening to Steve Raible’s fantastic descriptions and then you are on your feet staring at the television before anything incredible happens. We were deep in the 3rd. Seattle was going to punt the ball away, again. But wait, John Ryan did something different. He completed the first touchdown pass of his career. Before I saw anything, even the play, I lept off the couch and ran out the front door. I grabbed my axe and I started swinging the backside at the sheetmetal. My sheet metal slipped off of its stand onto the concrete walkway so I kept beating my axe on it as hard as I could. When I stopped, I saw that a neighbor was standing up the street looking down the hill at me with my axe. I cheered to him, waived and went back in the house. Thunder poured out of our yard at every score for the rest of the game, for the onside kick and for the OT cointoss. Before the 2nd score, which also was a bit of a wait, our daughters came home with their friend Alison. Alison told me that her mom got startled by the thunder just before the first touchdown and then she just started cheering. Mission accomplished. The 12 had been achieved. ONE makes TWO!! != 12!!!!!!! I started hearing banging and excessive noise from other places every time I finished bringing on the thunder. No 12 is silent. Information Technology people work 24/7 here and send instant messages via their company chat window to say ! @ to notify a scoring play. The representation of 12 is what is meant by the Seattle Sound area. The Seattle Seahawks came out of overtime on the first drive with a score of 28-22. Observers declared it a miracle. The excitement is going to keep unravelling as we approach the Super Bowl in Arizona. We are Seattle. We are the Seahawks. We are 12. Michael Bennet is riding this one all the way home. This entry was posted in Football, Perspective, Seahawks, Sports, Super Bowl and tagged #2ndConsecutiveSuperBowlWin, #LukeWillson, #NFCChampionship, #RussellWilson, #SeattleSeahawks, #Wilson, 12th man, 12thman, 49ers, 49ers rivalry, album, Alice in Chains, Arizona, artist, autism, autistic, awesome explosion, awesome implosion, axe, beyond, bills, Black, Boeng, Canadian football, canadian football league, CFL, change, children, city battle over stadium, concrete dome, controversy, dome, doomed, draft pick, earthquake, earthquakes, echo, echoed, escape, excitement, football, football game, forgive, fountain, full content, game, Garbage, hero, hometown pride, husband, Implode, Interception, John Ryan, Kevin Pierre-Louis, key arena, Keystone XL, kids, Kingdome, kingdome controversy, kingdome disaster, Kingdome Explosion, Kingdome Implosion, Kiro 7, like, link, links, loud, love, Luke Wilson, Lusty Lady, lyrics, mariners, Marshawn Lynch, mathematics, Matt Flynn, Michael Bennett, Microsoft, miracle, mismatched, Monster Trucks, music video, Nesbit's Fine Watch Service, new stadium, NextStep & Beyond, NextStep&Beyond, NFC, NFC Championship, NFL, Nirvana, northwest, Optimism, Packers, Pat Cashman, Paul Allen, Pearl Jam, PEMCO, Percy Harvin, Pete Carroll, playoffs, power, powerful, punt fake, quarterback, qwest field, radio, record, resonance, resonence, Richard Sherman, rivalry, Robert Turbin, Rock Concert, Russell Wilson, safeco field, save, seahawk 49ers, Seahawk 49ers rivalry, Seahawk first game, seahawk rivalry, Seahawks, seahawks first game, season, season tickets, Seattle, Seattle Businesses, seattle center, Seattle Culture, seattle football, Seattle freeze, seattle mariners, Seattle Music, Seattle Musicians, seattle pride, seattle soccor, seattle sports, sesame street, shake, sheet metal, soccor, socks and sandals, song, Sound Garden, sound waves, Sounders, Spoonman, stadium, Starbucks, Steve Raible, Super Bowl, Super Bowl 2015, Super Bowl 49, SuperBowl 48, SuperBowl2015, Taco Time, taco time commercial, Tacoma Dome, take chances, team spirit, televised explosion, television, teva, the 12, thrift shop, ticket holder, took chances, triumph, tv, Underground Seattle, vibration, video, waterfront, we are the champions, wife, woman, women, women like football, women love football, world, Ye Old Curiosity Shop, youtube by Jaco. Bookmark the permalink.